Hey there, and welcome to FRI! If you are wondering which research stream to choose from (there’s so many intriguing ones, for sure), then you’ve come to the right place. Let me explain why DIY Diagnostics is, arguably, the best research lab! Coming into DIY second semester of freshman year, I really only knew the basics of performing research. I didn’t have thorough knowledge of techniques like pipetting, plating, and using specialized lab equipment. Quite honestly, working in a college lab intimidated me. But with the help of the kindest, most enthusiastic mentors and a very supportive RE (Dr. Riedel or Tim), I started to feel more confident about conducting research. The Skill Developments that we worked on help review and hone the necessary scientific skills for success. I am so glad that I joined DIY – one of the best decisions I have made so far in college. One of the great things about the DIY stream is the breadth of research assignments that we work on. 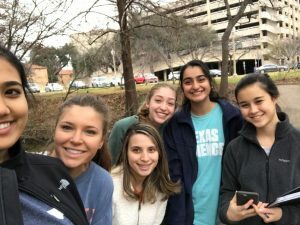 From collecting and measuring bacteria levels in water samples from Waller Creek to coding image analysis apps to 3D printing novel objects, we learn so many relevant skills. We are not simply a scientific lab, but a computer science one as well. Some of my favorite college memories come from lab, simply because you get so close with each of your fellow lab partners after spending numerous hours every week together. 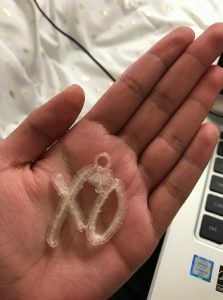 A few memories that especially stand out to me include trekking down to Waller Creek the day after heavy rains (very messy, to say the least), or when we were using the 3D printer to print whatever plastic object we desired (I printed the XO charm seen below). Overall, being in DIY Diagnostics has taught me so much about research, preparing me not only for future labs but for success in all my courses (especially in terms of time management). No matter what stream you choose, you will greatly benefit, but DIY is honestly the best. DIY – it’s do or die!